I’m a bit of a nut when it comes to my training and racing, but this weekend was extreme even by my standards. I hadn’t thought about the folks reading my blog when I started on my Odyssey, so I don’t have many photos to share from the experience. In short, it was three days, two 1,500 mile plane trips, and two hard races all compressed into one very busy weekend. Despite plantar fasciitis interfering with my race schedule, these were still races 12 and 13 of the year me– but I still have a long way to go before I can come close to my record of 23 races in one season. The Odyssey started at 4:45am last Friday, when my friend Mary Craig picked me up and we drove to the Seattle-Tacoma Airport for an early morning flight to Minneapolis-St. Paul. We arrived in the early afternoon, quickly drove the race course (which had been changed because much of the course had been flooded) and then built our bikes and prepped for the race on Saturday. Morning came early with a 5:00am alarm (3:00am home time) and then off to the transition zone to set up the bike for the race start. By 8:00am, my race was underway. First run was slow– I’ve been fighting plantar fasciitis all summer so my running speed isn’t nearly as fast as it was in the winter and early spring. Bike was awesome. The second run was just a touch slower than the first run, but I was consistent with my competitors who all ran the first leg far too fast. I crossed the line in 170th place out of 349 competitors. My age group is a bit more competitive as I was about two-thirds the way down at 20th place out of 30 competitors. While I’m used to winning my age group back in Seattle, I have to keep telling myself that Nationals are the big leagues. After the race, Mary and I played tourist for a few minutes before our flight out. St. Paul’s Cathedral was breathtaking. 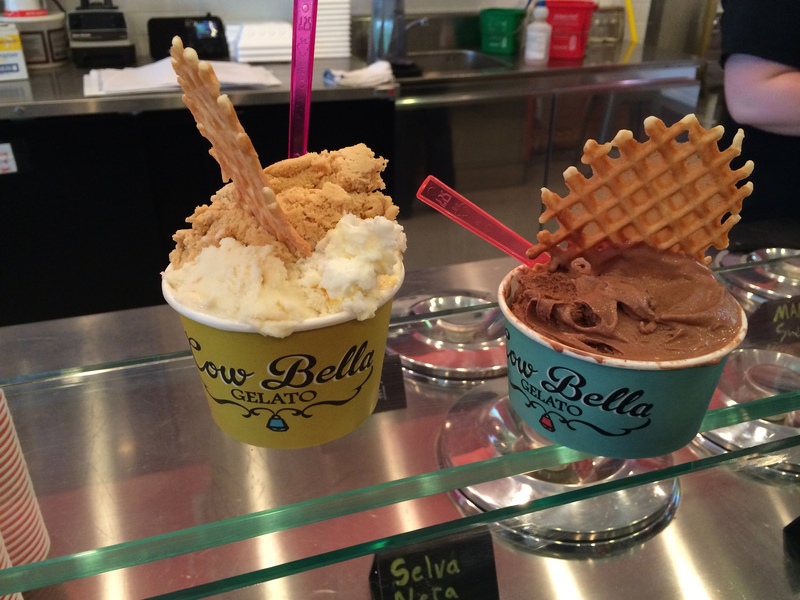 As cool and deeply spiritual as that was, my body and soul wanted something a little more sinful– and Cow Bella Gelato was just the ticket. Thanks Mary for finding this place– simply the richest, most incredibly intense gelato I’ve ever had in my life. I’m not sure what they do to their cows in the midwest to make their milk so perfect for gelato, but it’s clear that they aren’t sharing their secret with the rest of us. Really, St. Paul is now a vacation destination for me thanks to Cow Bella. Back up at 5:00am and into the car to drive to the Seafair Triathlon. 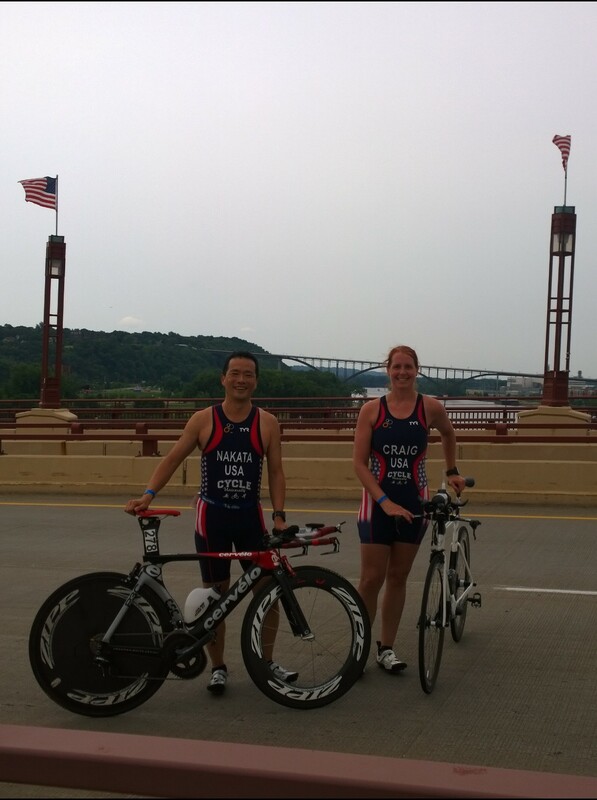 I was racing in the event’s inaugural duathlon, while Mary was racing the sprint triathlon (ugh, swimming is bad enough– but after this weekend, I thought it was impossible). Like so many inaugural duathlons, it wasn’t a “true” duathlon– no first run. It’s well-known that the run-to-bike transition is the hardest in multisport so my weary legs were thankful. We started out right after the first elite triathlete hopped on his bike– and we were pretty much keeping up there with the lead triathletes. It was utterly amazing riding on the I-90 express lanes between Mercer Island and the stadium. Off the bike and the run just felt awful. I was running about 2:00 per mile slower than my normal race pace and every step just hurt. There’s a reason cyclists can do stage races and runners do not. Nevertheless, managed 4th place overall out of a (measly) 32 competitors and first in my age group. At the end of the weekend, Mary and I kept using the word “epic” to describe the travel and back-to-back races. Part of the feeling of enormity comes from the logistical scale of it all. Up at 4:30a each day and going to bed late with race prep, flying around and racing multiple times in different cities in a 24-hour span like a grand tour cyclist. If you have a chance to do something as nutty as doing a big national event across the country and then flying right back and doing another race, don’t back down from the challenge. There’s nothing that makes you feel like you can handle anything that life throws at you quite like doing this.